I often take cooking inspiration from restaurant dishes. Sometimes I eat a great dish and instantly find a way to recreate it at home. Other times, the memory stays at the back of my head for months until I find the right way to cook that meal again. One such memory was a beetroot risotto I ate at Heston's The Fat Duck. In true mad science way, Heston's risotto is covered with a radish carpaccio and topped with beet chips and frozen sour cream pellets. I knew I would never replicate that, but I wanted to bring the deep pink of a beet to my risotto. 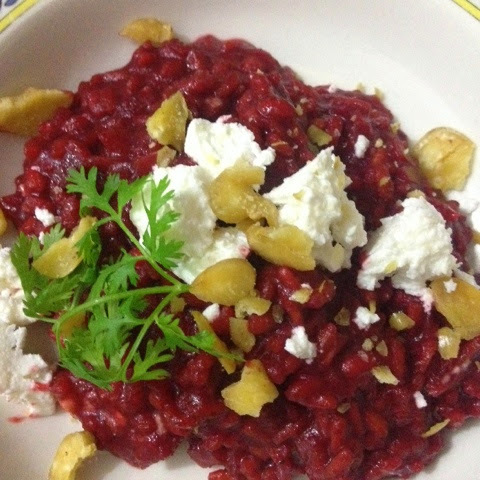 For my take on the beet risotto, I first peeled a small beet and roughly chopped it in cubes. Boiled it until it was cooked through. This cooked beet went into a blender alongwith a cup of water, a hearty pinch of salt and a handful of fresh thyme leaves. Once everything was combined into a thick puree, I added another 1 1/2 cups of water to create a thin beet stock. Since the stock needs to be warm while you are cooking risotto, I poured the stock into a saucepan and set it to simmer. In another pan, I heated a tbsp. of olive oil. In went half a cup of Arborio rice, which I stirred around until the rice was coated with oil. A couple of minutes later, I added a glug of red wine and when this evaporated, enough beet stock to cover the rice. From here on, you add stock gradually whenever the earlier addition looks like it's about to evaporate. Keep adding more stock until the rice is cooked but still has a bite to it. At this point, take the risotto off the heat and stir in a tbsp. of butter and 1/4 cup grated parmesan cheese. I topped the risotto with some crumbled goat's cheese. At this point, I felt that my dish needed some crunch. Roasted walnuts would have been great but I didn't have any on hand. What I did have were some roasted fava beans and I crushed and sprinkled them on for effect. Which turned out to be a brilliant move, the crisp beans forming a perfect pairing with the creamy risotto and cheese. Lovely recipe and as ususal - something that is exotic yet doable for a novice like me. Great to have you back blogging regularly and look forward to many more posts.